Workshops are not being offered at this time. Please contact Pat for more information. Experience encaustic–the ancient art of painting with pigments dissolved in hot beeswax, the same process used by the Egyptians to make their mummy portraits. Using modern materials and methods, learn about the beauty and versatility of this luminous medium: basic painting and fusing, incising lines and marks, creating texture and more. 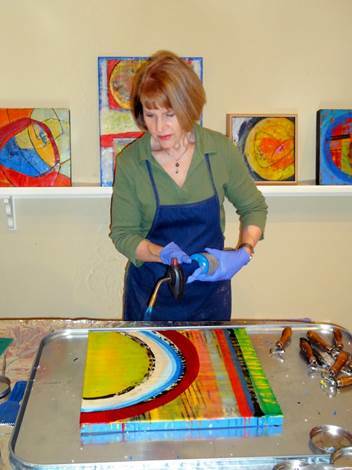 Regardless of your skill level, you will create several small, beautiful encaustic paintings to take home. This is a two-day workshop at my studio, 1209 Pendleton Street, Greenville. I limit the workshop to four people. Contact Pat for the current workshop schedule.